Of all the things homeowners control when selling their home, the condition of the property is one of the most important. 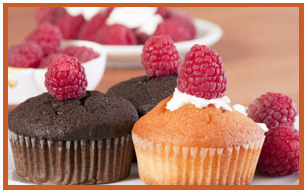 A crucial part of marketing any product is the presentation of the product. 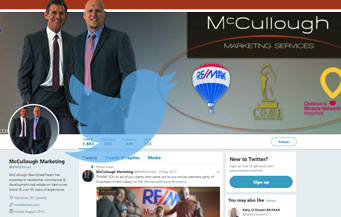 Corporations and retail businesses understand this concept and pay millions of dollars each year to advertising and marketing consultants to get the best advice possible. The same is true for real property. In order to compete effectively with other sellers, homeowners must present their homes to the marketplace in an attractive, desirable condition. When you bought your home, you probably comparison shopped. Well, buyers are still doing that today. According to the National Association of Realtors, the average purchaser looks at 10 to 20 properties prior to purchasing a home. Regardless of how many properties are on the market, available buyers will always seek the best-priced property that is in the best condition. You are not just selling a house. You are selling shelter, lifestyle, and dreams. People always want the best for themselves, and your home should represent the buyer’s answer to this goal.. Put yourself in the buyer’s shoes! Remember, they arrive at your front door wanting to find the right home. Don’t make them search somewhere else for it If you have done your homework, every room in your home will create a desire for the buyer to stay. Walk outside and take a look at the property through the critical eyes of a buyer. Is there anything that needs repairing, looks worn, or is outdated? Start writing these items down on your list. Walk through the interior and do the same things. Ask for the assistance of everyone in your family. After all, a shorter sales time will benefit everybody in the family. Do Everything Before Putting Your Home on the Market! Complete all of your repairs, improvements, and enhancements prior to your first showing. Remember, your best showings come early in the listing period. Be ready! How to Sell Your Home Faster and for More Money! The rule of thumb is, if something needs repair, fix it! There are probably many things in your home that you have simply become used to over time…things that you have been promising yourself that you will attend to. Well, now is the time. The buyer will mentally add up the cost of repairing all those minor flaws and end up with an amount that is generally much higher than what it would cost you to do the repairs.You might be saying to yourself, “these repairs aren’t any big deal.” But, what the buyer is thinking. “if the owners didn’t care for those little items, then what about the roof and the furnace?” Needed small repairs and perceived owner neglect will either lower the purchase price or lengthen the time required to sell. Check all walls for peeling paint and loose wallpaper. Large repairs: In today’s climate of open disclosure and vigilant professional home inspections, the rule is “treat a buyer as you would yourself”. Repair any problems with major systems or offer an allowance for the buyer to make repairs after closing. Always disclose anything you know about the property. Having been a consumer yourself, you know that buyers will more readily make a purchase decision with someone whom they can trust. Be cautious about selecting colors when painting or replacing carpeting. Your objective here is to make your home appeal to the largest possible buying segment. Ask yourself, “how many of the available buyers would be able to move into your house with all their furniture and not have to replace the carpeting?” Position your home on the market to be as livable to many people as possible. Forget your personal taste…the “market” is always demand driven! The average buyer will have a hard time looking beyond blue carpeting and bold wallpaper. Consider replacing unusual or bold colors with neutral tones. Two coats of white paint may be the best investment you ever made. Arrange furniture to give the rooms as spacious a feeling as possible. Consider removing furniture from rooms that are crowded. If necessary, put larger items into storage. Pack up collectibles…both to protect them, and to give the room a more spacious feel. Leave just enough accessories to give the home a personal touch. Dispose of any unneeded items. Remove all clutter and make it a habit to pick up clothing, shoes, and personal possessions each day for possible showings. Empty closets of off-season clothing and pack fro the move. Organize them to demonstrate the most efficient use of space. Leave as few items on the floor or shelves as possible. Use light to create a sense of space. All drapes should be open. Turn on all of the lights throughout the home before a showing, and be ready to replace any burned out light bulbs! 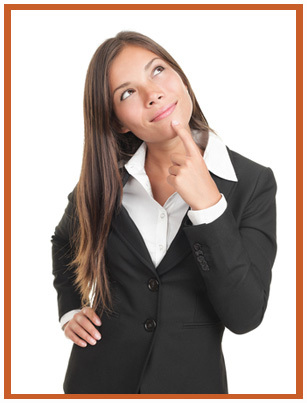 When placing yourself in the potential buyer’s shoes, you will want to consider the overall atmosphere of your home. Keep in mind your sense of smell as you go through the checklist. Create the atmosphere of your home as a shelter, a place that is safe and warm, and in good condition. A clean smelling house creates a positive image in the buyer’s mind. Be aware of any odors from cooking, cigarette, pets, etc. that may have adverse effects on potential buyers. Remember that some people are much more sensitive to odors than others. Smokers rarely notice the odor of tobacco that fills their homes, and pet owners may be oblivious to objectionable cat or doggy odor. You can use products like carpet deodorizers, air fresheners, and room deodorizers, but the best strategy is to remove the source of the smell rather than cover it up. Unfortunately, often the only way to remove the smell of pet urine from flooring is to rip up the carpeting and padding and replace them. If this is preventing the sale of your home, don’t hesitate to make this investment. If smoking or cooking odors have permeated your home, have your carpets and furniture cleaned, and air out or dry clean your drapes. Mildew odors are another no-no. Don’t allow wet towels to accumulate in hampers or dirty laundry to pile up in closets. Once offensive odors are removed, consider adding delightful ones. Recent studies have shown that humans have strong, positive responses to certain smells Cinnamon, fresh flowers, and bread baking in the oven are all excellent ways to enhance your property for sale. This part of preparing your home for sale is the most fun and involves the use of color, lights, and accessories to emphasize the best features of your home. Study magazine ads or furniture showrooms to see how small details can make rooms more attractive and appealing. The effect of a vase of flowers, an open book on the coffee table, a basket of birch logs by the fireplace, or a scented candle can make the difference in a room. The use of a brightly colored pillow in a wing chair or a throw blanket on a couch can add dimension to a sterile room. Soften potentially offending views, but always let light into your rooms. Replace heavy curtains with sheer white panels. Never apologize for things you cannot change. The buyer will either decide to accept or reject the property regardless of the words you say. You must present your home in the best possible way with complete honesty. Go through your photo albums and select pictures of your house and yard during all seasons. If hung at eye level in a well-lighted area, the pictures will speak for themselves and give you yet another selling stage. Take advantage of natural light as much as possible by cleaning windows, opening shades and drapes, etc. Add lamps and lighting where necessary. Be sure that all fixtures are clean and have functioning bulbs. 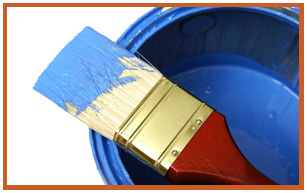 Check your home for any needed maintenance just as a buyer would. Repaint or touch up as necessary. You just can’t make a better investment when you are selling your house! Don’t let the outside turn buyers off before the inside turns them on. Color has the power to attract. A tub of geraniums, a pot of petunias, or basket of impatiens on the front steps is a welcoming touch. If you are selling during the winter months, consider using a wreath of dried flowers on the front door. If you have a porch or deck, set the stage with pots of flowers and attractively arranged furniture. Check to see that all doors and windows are in good working order. 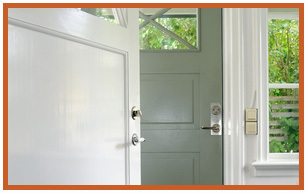 Give special attention to your home’s exterior doors and front entry. Clean and paint doors if necessary. Remember, first impressions are likely to color the remainder of the house tour. Wash all windows and replace any broken and cracked windowpanes. Screens should be free of any tears or holes. Inspect all locks to ensure that they are functioning properly. Check for loose or missing shingles. Invest in a new doormat that says “welcome’. 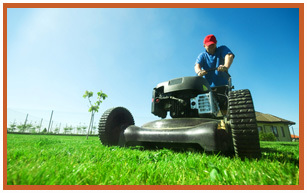 Make sure the yard is neatly mowed, raked and edged. Prune and shape shrubbery and trees to compliment your house. Consider adding seasonal flowers along the walks or in the planting areas. It is important to devote at least one area of your yard to outdoor living. Buyers will still recognize a scene set with a picnic table and chairs and respond positively to it. Cover your picnic table with a fringed, red-and-white checked table cloth, set out some plastic plates and glasses, bring out the barbecuing equipment, and buyers will almost smell the hotdogs cooking! The driveway is no place for children’s toys. Not only are such things dangerous, the clutter is unsightly. The surface of your driveway should be beyond reproach. After all, it is one of the first things a buyer will see when he drives up. 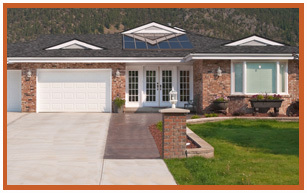 Sweep and wash the driveway and walks to remove debris, dirt and stains. Repair and patch the cracks, edge the sides and pull up any weeds. Whether a gracious proportioned centre-hall or a small space just large enough for a coat rack and a tiny table, this part of your home deserves your particular attention. Study your entry hall and ask yourself what kind of impression it makes for your home. Dried flowers or a small plant can make a striking focal point on a hall table any time of the year. Virtually any entry hall will benefit from a well-placed mirror to enlarge the area. Your entry hall’s flooring will be observed carefully by the prospective buyer. 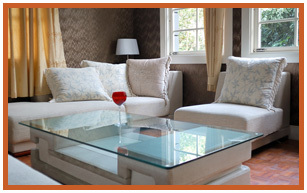 Make sure the surface is spotless and add a small rug to protect the area during showings. The entry hall closet is the first one inspected. Make it appear roomy. Add a few extra hangers. Hang a bag of cedar chips or a pomander ball to give a pleasant, fresh scent. Remove all off-season clothing. Sweep and clean the fireplace. Place a few logs on the grate to create an attractive appearance. You are welcome to have a fire going for showings during the winter months…it creates a great atmosphere. Place something colorful on the mantle, but don’t make it look like a country craft store. Improve the traffic flow by removing excess furniture. Have easy traffic flow patterns. Be sure that all doors open fully and easily. Draw attention to exposed beams or a cathedral ceiling with special lighting. Be sure to remove any cobwebs and dust. Remove oversized television sets if they dominate the room. If necessary, substitute with a smaller one until you move. 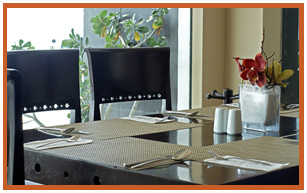 Set the scene by setting the table with an attractive arrangement. Add fresh or silk flowers as a centerpiece. Visually enlarge a small dining area. 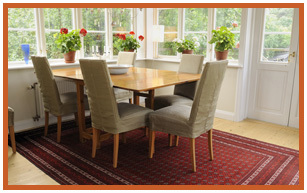 If your dining table has extra leaves, take one or two out. Consider placing your dining table against the wall. Remove any extra “company” chairs. Consider putting the oversized pieces in storage until your house is sold. pay particular attention to your kitchen. This room continues to be the “heart of the home”. A pleasant, workable kitchen is near the top of most buyers’ list of priorities and is a room that buyers always scrutinize closely. Avoid clutter! 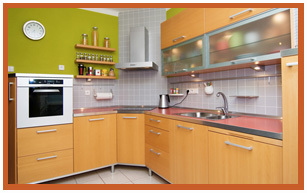 Clean counters of small appliances and store whenever possible to maximize the appearance of workspace. Check the countertop around your sink, and remove any detergent or cleanser, etc. that may be cluttering the area. 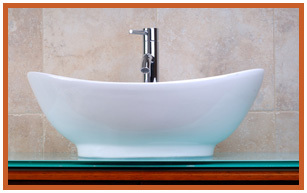 Sinks, cabinets, appliances and countertops should be clean and fresh. All appliances should be absolutely clean, bright, sparkling and shiny! Clean off the top of the refrigerator! If you must use that space for storage, use baskets and bowls to camouflage the items kept there. Set the scene with an open cookbook, a basket filled with fruit, a basket of silk flowers, or a ceramic mixing bowl and wire whisk. 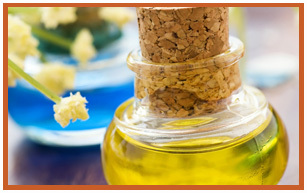 Create the aromas associated with happy homes! Bake some cookies from pre-mixed, refrigerated cookie dough, or bake a loaf of refrigerated bread dough, or just pop a frozen apple pie in the oven. In the heat of summer, place a bowl of lemons or limes on the counter to provide a fresh and pleasant aroma. Clean and organize all storage space. If your cabinets, drawers, and closets are crowded and overflowing, buyers assume that your storage space is inadequate. Give away items you don’t use, store seldom-used items elsewhere, and reorganize the shelves. Neat, organized shelves and drawers look larger and more adequate for prospective buyers’ needs. Large, cheerful kitchen windows are an advantage and should be highlighted as a special feature of your home. 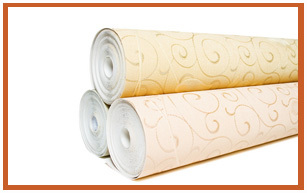 Take a critical look at the window treatment…is it clean, sharp and up-to-date? Do the curtains need washing or the blinds need cleaning? Would the window area look better without any window treatment? Set the table for an informal meal with bright place mats and a generous bowl of fruit as a centerpiece. Add a fresh coat of paint or put up a cheerful wallpaper. Organize all closets and storage space. Remove all dirty laundry. Keep current with your laundry or store all dirty laundry in a closed container. 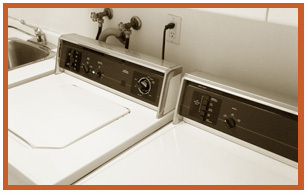 Clean and polish the washer and dryer. Consider adding an attractive, coordinated throw rug. Make certain the stairs are safe! Stair lighting should be more than adequate, stairs must be clutter-free, stair railings tight and secure, and runners or carpeting tacked securely. Remove any items from the surface of the stairs and store elsewhere. Check the condition of the walls, and pain or re-wallpaper if necessary. 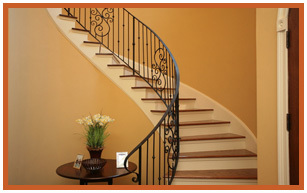 If the stairs are a focal point of the main living areas, carefully choose accents to improve the visual appeal. If you have a wide, gracious staircase, emphasize this feature by hanging a few pictures along the wall. Draw attention to a handsome lighting fixture by polishing the brass and dusting each small light bulb or crystal prism. Large master bedrooms are particularly popular among today’s home buyers. Make your bedroom larger. Paint the room a light color, remove one of the bureaus if the room is crowded, and minimize clutter to maximize spaciousness. Aim for a restful, subdued look. A private bathroom off the master bedroom is a real sales plus. Decorate to coordinate with the color scheme of your bedroom, creating the “suite” effect. Virtually all buyers are looking for a house with plenty of closet space. Try to make what you have look generous and well-planned. Remove and store all out of season clothing. Remove any items from the floor area. This will make a closet seem more spacious. Arrange all shelves to maximize the use of space. Make sure all articles in the closet are fresh and clean smelling. When prospective buyers open your closet door, they should be greeted with a whiff of fresh smelling air. Make sure all closet lights have adequate wattage and are operating. Add battery-operated lights to those closets that lack them. Lighted closets look bigger, are more attractive and allow buyers to inspect the interiors easily. Consider promising a special reward if they willingly participate in your house-selling goals. Have them pack up any items that are not currently in use and dispose of unused possessions. Remove any crowded, unusual or personal wall hangings such as posters and store them until your home is sold. Wise sellers take special pains when preparing their bathrooms for scrutiny by strangers. The bathroom is a room and a very personal one. Prospects will inspect yours carefully, so be sure it is immaculate. Cleanliness is the key! Make sure that all surfaces are spotless. Replace worn or dirty shower curtains, clean and repair caulking, and remove non-skid bath decals that are in poor condition. Clear off countertops and store all personal care products out of sight. Repair any faucets that leak or do not function properly. Clean off mineral deposits with vinegar or commercial products. Clean and organize all cabinets and drawers. Don’t forget the medicine cabinet and the storage cabinet under the sink. Dispose of old items and polish the shelves. Remember to appeal to a wide variety of buyers. Play down dominant colors with contrasting neutral colored towels and accessories. If your bathroom is mostly white or neutral, add a few cheerful accents of color. Don’t hesitate to buy a few new towels and a rug…you’ll be taking them with you to your new home. Scrub and wax an old floor. Cover the largest area you can with a freshly washed scatter rug. Decorate and personalize to create a pleasing, individual look. 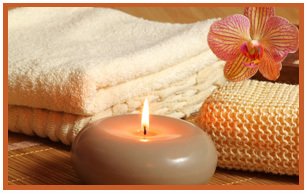 Consider bringing out your best towels and perfumed guest soaps. Add a plant for color and freshness. A gentle hint of fragrance in the air is fine, but keep it subtle. Sweep and wash the floor to remove dirt and stains. 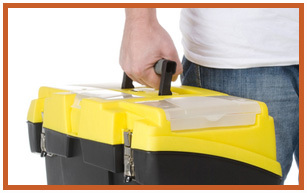 Organize tools, garden equipment, bicycles, etc. A clean and organized garage appears larger. If the area is dark, add more light. If it is small and accommodates only one car, remove your car before buyers visit. An empty garage always looks larger. If you have a two car garage with very little extra room, remove one of your cars so that buyers can make their inspection in comfort. Get rid of anything that you don’t plan to move to your new home. Place remaining stored material neatly in boxes, and position away from walls. Important Points to Remember When Showing Your Home! Increase your chances. The more people who see your home, the more likely you are to sell it quickly. Yes, it is inconvenient to show your home at dinnertime, but if the people buy your home, isn’t it worth it? There shouldn’t be any major house cleaning at this point. The types of tasks you ought to be concerned with now are simple ones: making beds, stuffing last night’s dirty pans in the dishwasher, picking up loose newspapers, etc. Even young children can participate by “cleaning’ their rooms. Keep your thermostat at a comfortable setting. Turn on all the lights for every showing before prospective buyers arrive. This also gives you an opportunity to select the lighting effects you want for each room. No area of your home should be dark. Turn off the television and turn on soft background music. Arrange for pets and children to be at a neighbor’s house. Perhaps it is unfair to lump children with pets, but young children can distract buyers from their purpose. Keep pets away from buyers. Don’t try to “sell” the house with words! By this time, you have prepared the house for sale…let it sell itself. Buyers buy on emotion – theirs, not yours! Keep emotions under control. “Depersonalize” the house as much as possible. Take down any extra family pictures that are hanging on the walls or displayed on the shelves. They will often distract the buyer’s attention from what is most important…the house! Most importantly, please leave the home ensuring all showings if at all possible. It is uncomfortable and difficult for buyers to view the home when owners are present. Often times, they will rush through the home and not give it the proper attention your home deserves. It is also hard for the buyers to “picture themselves” living in the home when the sellers are present. Keep in mind that BUYERS want to obtain the LOWEST PRICE and BEST TERMS for themselves. Willingness to consider an offer less than the listing price. Terms under which you would sell. Items of personal property which you “might” be willing to include in a sale. Any confidential information that would serve to disclose your negotiating strategy.